Whenever I go to a club with a QSC PA system, I'm always knocked out by the sound. Whenever I go to a club with a QSC PA system, I'm always knocked out by the sound. 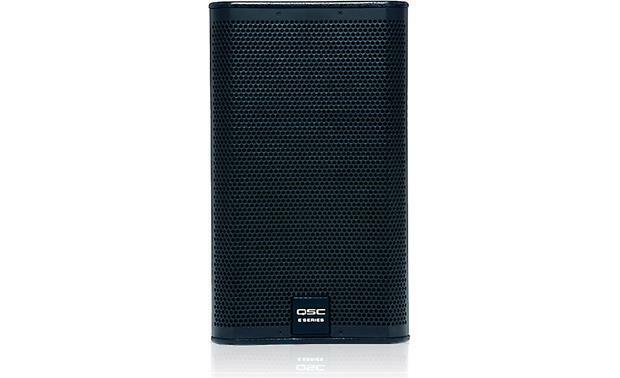 The E110, QSC's latest entry in the non-powered speaker arena, follows in this tradition of impressive performance. It features a heavy-duty 10" woofer and a 1" compression driver in a compact plywood enclosure with a cool black textured-paint finish. 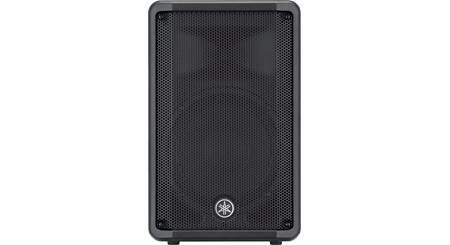 The speaker can sit upright on a stage or a pole, fly by hang points in a permanent installation, or lean back in wedge position as a stage monitor. It can handle up to 300 continuous watts, delivering powerful, clear sound for your audiences and musicians. 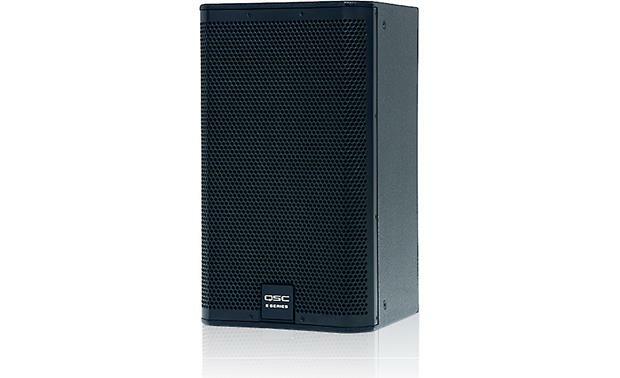 QSC designed the E110 to work well with any amplifier or mixer, but its performance is greatly enhanced when you pair it up with a QSC GXD or PLD model power amplifier or a TouchMix digital mixer. The built-in signal processing in those products optimizes this speaker for live sound, floor monitor, karaoke, or DJ applications, either with another speaker, a subwoofer, or by itself. The E110 features metal dual-angle pole sockets that allow it to mount on a pole-stand either facing forward or tilted downward at a 10° angle for better audience coverage. A foam-padded metal grille protects the drivers from damage on the gig or in the van. The metal carrying handle on top helps when you're moving the speaker around. 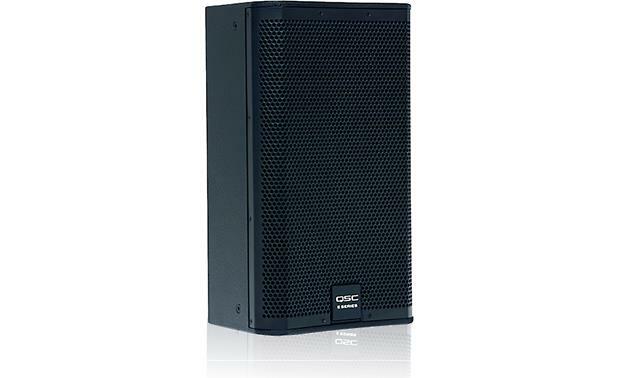 Overview: The QSC E110 is a passive, two-way loudspeaker with a multi-purpose design that can be used either as a stage monitor or as a main PA speaker. It features a 10" woofer, with a die cast frame and a 2.5" voice-coil, along with a 1" compression driver, housed in a durable plywood enclosure that's coated in tour-grade textured paint and includes a foam-lined perforated steel grill. The E110 is capable of outputting 300 watts of continuous and 1200 watts peak power. Mounting: The E110's multi-purpose design allows it to be used for a wide variety of applications including for touring musicians, houses of worship, rental and production companies and more. Two sets of rubber feet allow the speaker to be seated either upright or on its side as a stage monitor. 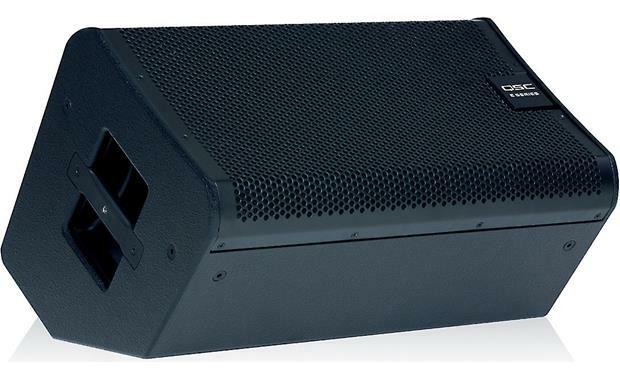 This second option lets the speaker to sit at a 55˚ angle, allowing it to be placed right in front of a performer when used on a crowded stage. Multiple threaded mounting points are located on the top, bottom, and sides of the speaker for use with the optional E-Series Yoke Mount or M8 Eyebolt kit. The Yoke Mount bracket can mount the speaker to a wall or ceiling, while the M8 Eyebolt kit allows it to be suspended or "flown" upright or on its side. The E110 includes two 35 mm sockets for pole-mounting. One mounts the speaker level while the other socket provides a 10˚ down-angle for improved audience coverage. An integrated carry-handle on the top of the speaker makes for easy portability. 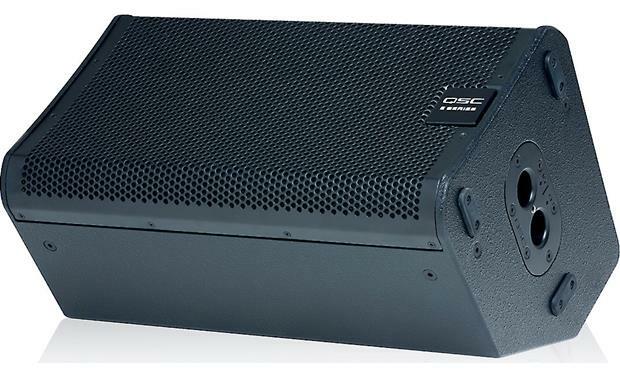 DSP: QSC E-Series loudspeakers can be used with any high quality, appropriately powered amplifier, but can achieve greater performance when used in a complete E-Series Entertainment System. QSC GXD and PLD series amplifiers, as well as TouchMix digital mixers, feature built-in DSP (Digital Signal Processing) that's matched to the speakers, greatly enhancing the overall sound from the system. Wiring: The E110 includes a 2-terminal barrier strip, for a direct speaker wire connection, as well as two NL4 (Speakon) connectors that are wired in parallel. One acts as the input to the speaker while the other is a pass-through for daisy-chaining multiple speakers together. 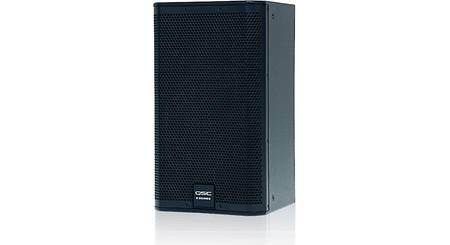 Dimensions: Width - 13.0", Height - 22.250", Depth - 13.0"
Searches related to the QSC E110 10" 2-way PA speaker — 300W continuous.